In 2012, Carnegie Hall launched a "Lullaby Project" to help young mothers write lullabies for their babies. Five years later, the project is spreading across the country. The project began at Jacobi Medical Center in the Bronx. "Young, expectant mothers were under tremendous stress and needed to be motivated to attend their medical appointments," the New York Times explained. "They needed a sense of community, and they needed ways to understand the reality of what was happening to them." 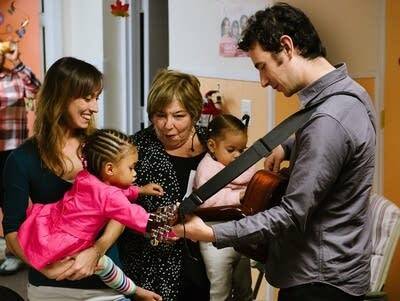 As part of their regular wellness visits, the young mothers worked with composer Thomas Cabaniss to write and record original lullabies for their babies. The program operated under the auspices of Carnegie Hall's Musical Connections, which still runs the Lullaby Project as it spreads nationally. Minneapolis is among several cities that have hosted Lullaby Project satellite programs. This year, the choir VocalEssence worked with four teen mothers at Longfellow Alternative High School: the moms wrote the songs, and VocalEssence staff helped out with the harmonies. "We ain't writing your song. We ain't writing about your life," said composer Melanie DeMore, as reported by the Star Tribune. "It's your life. It's your song.nAnd our job is to help you figure out how to sing it in the best, sweetest way." At the Rikers Island prison, Lullaby Project musicians worked with inmates who are mothers. "When it comes to our children and stuff," said one mother, according to NPR, "it brings out the best in us. You know, we all became songwriters for them, right?"